He is such a refreshing change…the profound statement needs a justification. Sure it does. With our copies surviving on the clichés - 'Oh, I am glad for the XYZ for giving me the opportunity', ' I am doing this for charity', 'My heart goes out for the poor children, 'I don't care about style as long as I am comfortable in my skin'…. most of them sincerely carried forward like the relay baton! But the short-statured, terse, occasionally smiling Rahul Bose was such a breather. Nothing can stop him from calling a spade a spade. Whether it is the terrifying feeling of walking the ramp, the need to put in more money into culture, the dividends he gets for working, lack of funds for releasing the critically acclaimed Japanese Wife, the actor has a clear cut take on all. In the city to walk the ramp for Signature 7 Sensations Fashion Tour that kickstarts from Chandigarh on Thursday, the actor with his razor sharp wit ensured the ball hit the boundary line. "Quiet often I ask myself why on earth do I do this (walk the ramp). It is always a terrifying thing and I feel great once the act is over," says Rahul Bose, explaining why he chose to walk the ramp for Signtaure's new and exciting tour. "If a brand like Signature is spending money on something like fashion, wherein I will also get paid (he smirks), I don't mind being a part of it. This money can fund the education of kids," says Rahul Bose. He is constantly reminded to talk to us only about fashion, and nothing else. But can you really dictate terms to an actor called Rahul Bose? "There can be no movement without money. Culture, folk art, puppetry or an off-beat movie can only survive if backed by money. A well-developed society has space for everything, for fashion, cricket, other sports, commercial and parallel cinema," he says. Yes, he sounds different, and it doesn't take anything to be one. "Knowing the fact that I could break my face, which would affect my acting career, I went ahead with rugby. Who would do it? When I could settle with less hardwork, why do I need to work in the Andaman Islands after the tsunami?" he questions, leaving us to figure out 'the' Rahul, the actor with a difference. "I am not the most sought after actor. I am not a too big a star to be affected by the industry. They would be happy to leave me alone," he smiles. (Are we supposed to understand the sarcasm?). With Rahul around how can we not ask him about Japanese Wife? "It released only in five cities because we didn't have more budget. I think this holds true for many small films, which are waiting for a release. I don't see any solution. DVD is the only answer maybe," provides Rahul, whose next film is based on the book Moth Smoke. Here, art means picking up an old newspaper, an old piece of cloth, food or anything that catches your fancy, and creating your own masterpiece. Stunts would mean using your body as a paintbrush and learning musical acrobats. Fun means total MADness that comes with parent-approved tag! If you have a kid at home who is painting your walls, tablemats and anything that he can catch hold off, then you know what we are talking about. The world of MAD Art on POGO and its iconic lone ranger - Rob. The longest running kids show host was in city for the grand finale of MAD arts Smart Potato summer workshop at the Shivalik Public School in Mohali. Interacting with the kids and their parents, Rob did what he knows best — spread the madness! "There is no fun in teaching different things the same way. We have to teach similar things in a different style. The experience with the Smart Potato workshops has been great as it encourages kids to learn and explore things outside their classrooms and home," says the popular host and 'dost' on the show. Inspired by everything around him, the cheerful and vibrant artist has been instrumental in providing unique fun and exciting creations in the interactive art show. His live art creations on the show have turned couch potatoes into artists. "It's all about imagination. Working with kids on the show and through the show, I have realised that they have a better way to understand art, as their imagination has no restrictions. Art should not be the learnt the 'art-school-way', instead it should be a little more fun." And his way of teaching - fun! "There are no set formulae for creativity and with so many possibilities, you have to offer it in a fun way for the kids to learn." And that's what he exactly does - makes a submarine out of a plastic bottle or turns a plain paper, whether A4 or 40ft, into an exhibition display item. Something that has also won him the best kids show host award six consecutive times and a bagful of international awards for the same. "I am happy that people understand what I do on the show and appreciate it." But then like his fans, he too was an artist in the hiding. The pass-out from the National Institute of Design and a graduate from Delhi College of Arts, confesses to having been a science student in school. "Art was a big switch for me and when I decided to pursue my creative instincts, even my family was a little surprised. But times have changed now, we have so many youngsters following their dreams on canvas," he says. 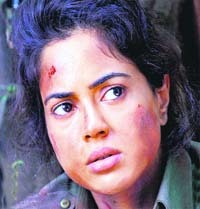 The sultry Sameera Reddy, who first appeared in Ghazal singer Pankaj Udhas's Aur Ahista music video and debuted in Maine Dil Tujhko Diya in 2002, is enjoying her new look in Ananth Mahadevan's Red Alert, a film about naxalites from Andhra Pradesh. The viewers watched her in Buddhadeb Dasgupta Bengali film Kaalpurush in a non-glamorous role. Now, she is gearing up for the release of Red Alert where she plays a naxalite. Q: What was the first thing that came to your mind when you heard the story of Red Alert? A: Dynamic story of naxalites waiting to be told. Q: What is the film all about? A: It is a real life story based on a news headline. It is probably the first Indian film in which every line is taken from real interviews. The naxalite issue is the backdrop of the story. Q: Tell us about your role? A: I play Laxmi, a girl raped by the cops, who is found languishing in the toilet during a naxalite raid. Her story is about how she is motivated to wield a gun. Q: What was the biggest challenge for you in this film? A; The biggest challenge was moving around and crawling on the stony terrain without kneepads and protective gear. The sequences we had to shoot in real rain were really difficult. Q: Did you undergo any special training for the film? A: I did not undergo any sort of formal training, but I did study about the life of naxalities. Q: How was the experience of working with director Ananth Mahadevan? A: Ananth Mahadevan is great friend. I always wanted to work with him. This is completely Ananth's film, which has won the Germany Director's Visionary Award at the Stuttgart Film Festival, and at New York Suneil Shetty won the SAIFF best actor award. A: Mahayoddha Rama and Race 2. Bollywood actor Bipasha Basu has launched her own line of fitness clothing named BBloveyourself along with Reebok. "I have launched my own line of fitness clothing called BBloveyourself with Reebok! Fun range, available at all outlets. Check it out," she posted on Twitter. A self-confessed fitness freak, the actor had earlier released a fitness DVD with the same title. "Fitness and health are becoming really big in India. Boney Kapoor's Milenge Milenge is the 13th film directed by actor Satish Kaushik. It is releasing seven years after it was made. Unforeseen circumstances have delayed the film and it is nobody's fault. It is a well-made film that stars Shahid Kapoor and Kareena Kapoor. The lead pair has a good chemistry. The promos are already out and have generated a lot of curiosity among the viewers. Himesh Reshammiya has composed the music and two songs will be definite chartbusters. Watch Shahid-Kareena jodi in Milenge Milenge. Sumrit Shahi deals with what, probably, every teen deals with — trying to make sense of the nomenclatures 'special friends', 'true friends', 'just friends'. To each his own! "On Valentine's Day, I was sitting over coffee with a friend when we were tagged as seeing each other or something of the sort. I was like can't a boy and girl having conversations over coffee, be just friends?" 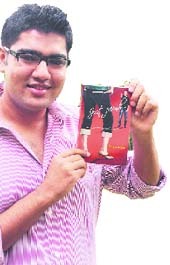 the 17-year-old wallows in the 'wow' feeling of coming up with his first book and begins sharing the freak incident that acted as the trigger point for Just Friends. Like we said, the author tackles the million dollar question — can a girl and boy just be friends or rather can a girl and boy be just friends? He knows everything about her…she knows everything about him…he has her picture…she has his number on speed dial…there's a big YET to the entire situation. They still don't love each other, they're just friends. Adds Sumrit, "The book is a journey of two characters who meet on a flight…decide to share coffee and end up sharing life…Can a girl and a boy liking, living, loving, lusting, losing…each other be just friends." Thrown in is spoken, colloquial lingo, generous use of slang (read yaar, hey, shut up)…the narration's dotted with situations forming a routine of any average adolescent. Coffee shops, group studies, et al… "I tried edging out characters and extracting things out of every situation, for example MSN chats," adds the St. John's alumnus. "Had I not been a part of the Crucible, creative writing club of my school, I don't think I would've been able to pen it." Meanwhile, originally meant as a short story, the book just happened. He smiles, "As soon I had the urge I'd write, at times even on a tissue paper. Six months after the idea, I thought of writing a short story but even before I knew, I was writing a book," and adds, "I penned down the book in four to five months, but it happened in phases." As for now, what's on cards is class XIIth board exams. "Right now I'm just concentrating on my exams. As for making publishing a career, I have a couple of ideas in mind." Back to square one, so can a girl and boy just be friends? He smiles, "Well, for that you have to read the 264 pages," and adds, "It all depends on how you define relationships, love and friendship." When our son and daughter-in-law left a thriving medical practice at Chandigarh and re-located to Australia, a fear of the unknown plagued each one of us. How would the new country treat them? How would they manage without family support? How would they cope with a garden that runs over a large area covering slopes, massive boulders and a part of the forest? How would our nut brown grandson manage to hold his own in a largely white peer group? The questions were unending, the answers unknown. Two years later, my mind is at rest. Dhruv is at the top of his class in academia. He has won every squash tournament; tried out surfing; attended survival camps; is learning the guitar and proved to be independent of thought and action. In Bendigo, racist slurs are unheard of. An occasional foray into town, gives a glimpse of the dirty under-belly of Ozzieland. In India, the cruelty we mete out in the name of khap and caste, exceeds even unimaginable parameters. Glynnis and Corrina have just left after their weekly clean up session. They drove up in their Ute (utility vehicle), which is loaded with detergents, ladders, brushes, brooms, vaccum cleaners and washcloths. The A$ 45 per hour includes all materials. Both work quietly and efficiently. They leave the kitchen and bathrooms gleaming; the carpets spotless and wet clothes hanging from the line. Glynnis has a sleep disorder and visits a hypno-therapist for counselling. Corrina has a painful abcess in the gum but does not take the day off as she can still use her limbs. Kevin is busy in the garden laying out wheel barrow loads of wood chips on the slopes and along the fencing. These retain moisture in a drought-ridden state, as well as prevent weeds from taking over good soil. All three workers have a house key and enter without any fan fare. No one has to supervise them or be afraid of their removing any valuables. In the evening, Rosa will drive up with the warm, freshly ironed laundry. When Nathan comes to wash out the wall-to-wall carpeting, he brings a tanker of water so that your scarce supply is safe. Support systems? I think they are well in place even by our desi standards. Everything comes at a price. Hard earned money can be put to use for a great standard of living. Glynnis lives on a farm and the security system is wired into Melbourne. If there is an intruder or fire, the police will be the first to know and react immediately. The CCTV cameras will guide them to the exact spot in Glynnis' home. I enjoy talking to the ladies as their intellectual capacity, dedication and value systems are far ahead of what we consider their lowly work status. Saturday and Sunday caught all of us weeding the garden. As Oz and I fought with deep- rooted dandelions, Dhruv sprayed weedicide along the fencing and Jayant used a mechanical blade to cut aggressively tall, wild grass. He wore ear-muffs against the sound. It was quality time with the family. Charu donned gloves and tamped down cuttings in the rockery. By dusk at 5.30 pm, we all homed in to light the fire and sit around with a glass of beer. Dinner over, the dishwasher stacked, clothes transferred from washing machine to dryer, we tucked ourselves into bed by 10.30 pm. Dullsville you might say, but as we snuggled under electric blankets for a long, dreamless sleep, there was the satisfaction of a day well spent. There is none of Chandigarh 's sparkling night-life, but then, tired, healthy individuals, create little trouble when they are asleep. Can this be a solution to the daily violence witnessed by the tricity?